To adjust the Warp Region settings, open the relevant Process Control Panel. To do this, first make sure the correct Warp Output, or the Warp Input Process Control Block is selected (green), and the Session window is active. Then press the P key on the keyboard (or the "open" arrow in Warp Process Control Blocks) to open the Control Panel as shown right. Make any required adjustments and then press P again (or the close button) to close the panel. You can repeatedly try modifying the parameters in the Control Panel and listening to the result. The control panel can remain open, the controls adjusted and processing run while signals are playing. Each of the controls shown has a "pop-up" explanation which will appear shortly after hovering the mouse pointer over a slider control or parameter display box, so the controls won't be described in detail in this User Guide. Most of the settings in the top area of this control panel (shown right) have been described in Adjusting APT settings. Separation of Musical Notes contains the following controls, which do not normally require modification. Threshold - The change in pitch to restart a new note boundary. Min. Length - For pitch values to be made into a note, they must be within the pitch threshold for this minimum length of time. View Level in the Level section will enable the display of the measured Level values. (This option is enabled by default but the Pitch and Level displays are not shown at the same time.) Levels will be displayed in groups of measurements (like notes) and shown as Blocks at the top of the track display. 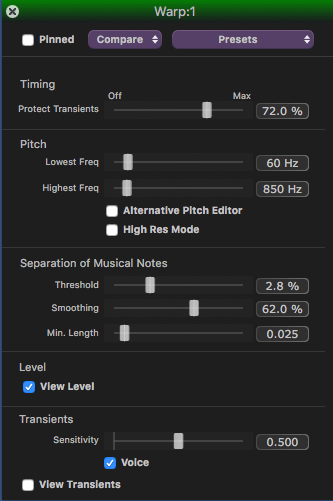 Transients Sensitivity, Voice and View Transients are described in Manually adjust timing, pitch and level. The main editing of the Output's time, pitch, level, etc. is described briefly next.